Yesterday was day one of the 2018 Promotional Products Association International Expo in Las Vegas and Magellan Promotions is here learning about all of the new and trending items that are coming to our industry in 2018 and that can help you achieve your goals. The expo has 3,100 booths from 1,260 exhibitors and welcomes more than 21,000 people. This year, there will be more than 600 new products on the show floor, so we have our work cut out for us. Here are a few of our favorites from the show yesterday. Everyone likes to give away golf balls for golf outings, right? After a while, the same golf balls can get kind of boring. Looking for a new spin? How about mints, sunscreen and lip balm, all packaged as golf balls. It’s a creative way to give away items that are great to have in your golf bag, and you stick with the golf ball theme. They even come with a great golf-themed packaging as well. Want just two of the three options? We can do that too. Just ask! Put something more than a logo on your pens. With this new 360 degree imprint, you can use the entire pen to get your message out. Whether that’s a football schedule (see right), your mission statement, or anything else you can think of, you can include it on this Assant Stylus Pen, which comes with a stylish matte metallic finish and a comfortable etched rubber grip. One piece decorated pieces are really hard to come by in this industry. This production partner has really figured out how to do it economically and effectively. 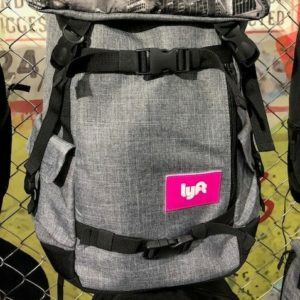 New products from this production partner are their backpacks, which are fashion forward and really well thought out. Two nice imprint areas for this product, one of which is full color, so you can have a lot of fun and creative with the artwork. Want to branch out from the typical plaques for awards? Completely personalize a bag for your winner so they can sow off their accomplishment wherever they go. There’s no charge for customization, so whether you’re ordering a thousand or just one, this is a great backpack. The 16 oz. 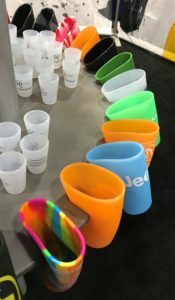 Silicone Pint glass is a unique item that we saw at the first day of the PPAI show. These pint glasses won’t break, crack, chip, fade or scratch. Plus they’re microwave, freezer and dishwasher safe. They even withstand temperatures from -80℉ – 450℉. We love this item for colleges and corporate clients alike! It’s great for student giveaways or employee incentives.